LDI Adjunct Senior Fellow and executive education expert Kathryn Pearson leads a session in the newly-launched University of Pennsylvania Physician Leadership Academy that is a collaboration between the Wharton School, the Leonard Davis Institute and Deloitte Consulting. What does an exploding rocket ship have to do with physicians who have been promoted to executive jobs in some the country's largest health care systems? Potentially, a whole lot says Kathryn Pearson, PhD, who used a dissection of the decision process that led to the 1986 Challenger Space Shuttle explosion as part of her decision science lecture to the first class of the University of Pennsylvania's new Physician Leadership Academy (PLA). Pearson, President of the executive development consulting firm Enterprise Learning Solutions is also an Adjunct Senior Fellow at Penn's Leonard Davis Institute of Health Economics (LDI) and a former Adjunct Professor of Operations and Information Management at the Wharton School. She pointed out to the physician students that the Challenger disaster -- caused by a blown out booster rocket O-ring and a cascade of NASA and Morton Thiokol decisions based on incomplete data about rubber and sub-freezing temperatures -- has become a classic case study in complex and high-risk decision making. Wharton School faculty member Guy David, PhD, is the Academic Director of the Physician Leadership Academy, and an LDI Senior Fellow. Also see the unique posters created at the sessions. But in her initial presentation, Pearson couched the data and details of the Challenger case as if they were a racing car driving team's dilemma. The PLA participants were then asked to review the data and make decisions about what the driving team should do. Gathered in Wharton's Aresty Institute of Executive Education, the twenty two top health executives that make up the first PLA cohort announced their answers and were then surprised to learn it was actually the Challenger case and that they had missed a simple but crucial data flaw. "That Challenger exercise was one of the things that sticks in my mind about the day's sessions," said Harvard's Craig Bunnell, MD, MPH, MBA, the Chief Medical Officer at the Dana-Farber Cancer Institute. "It was enlightening to see how people -- including me -- did the same things and made the same mistakes that were made by the managers in the Challenger case," he said. Exercises to create similar bursts of new insight were embedded throughout the four-day opening PLA program module that is designed to teach physicians about the essence and elements of leadership and how to think in ways they were never previously trained to do. The Physician Leadership Academy program, a collaboration of Penn's Wharton School, the Leonard Davis Institute and Deloitte Consulting, takes place over nine months with three- and four-day on-campus modules in October, March and June. PLA participant Jeffrey Desmond, MD, said he signed up in the program because "Part of what I realized as I moved through each level of my organization was that the skills and knowledge that allowed me to be successful at one level were not necessarily what I needed to be successful at the next level." Desmond is the Chief Medical Officer of the University of Michigan Health System that runs three hospitals and 150 clinics. "One of the most important things to understand is that this is not an MBA program," explained PLA Academic Director Guy David, PhD. "The participants are physicians who hold leadership positions in their organizations and are coming here to learn about the sort of leadership skills that were never part of their medical training." 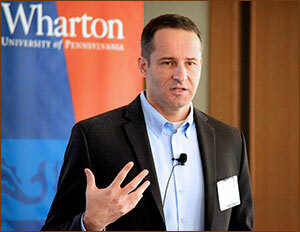 David, an Associate Professor of Health Care Management at the Wharton School and Senior Fellow at LDI, is also the Director of Wharton's Doctoral Program in Health Care Management and Economics. According to David, the new Academy is unique in both scope of content and program length. Equally unusual is the 2-to-1 faculty-to-student ratio with individual students assigned a mentor and a coach who stay directly in touch with them during all nine months. The coaches and mentors are Deloitte staffers -- many of them physicians themselves -- who have in-depth experience in leadership and management coaching in large scale health care facilities. Jennifer Radin, MBA, MPH, one of PLA Deloitte mentors, said the program was designed to be academic as well as experiential. "It's set up with three modules with very discreet but connected objectives and themes that build upon each other," she explained. "From adult learning theory we know that you learn a bunch of new stuff, digest it, create your own narrative and then go practice it. We wanted space between modules over nine months so people can absorb, internalize and act on what they've learned." Over the last decade, the trend of promoting physicians to C-suite positions in health systems has accelerated as a result of health reform efforts and the Affordable Care Act. Five years ago, the American Medical Association noted that "Physician leaders are viewed as more important than ever to closing the divide between clinicians and the administration as they try to create accountable care organizations, reduce readmissions, improve care and implement electronic medical records." However, although doctors bring in-depth clinical knowledge and experience to their executive positions, most have little or no formal training in the sort of leadership skills required to successfully manage a sprawling health system enterprise -- a point made by several of the PLA students themselves. "I'm in a senior leadership position and have some skill gaps as a physician who is not formally trained in that field," said Michael Harris, MD, Senior Vice President and Chief Medical Officer of Englewood Hospital and Medical Center in New Jersey. "Traditional medical school had no leadership training and that's still not part of the curriculum of most schools -- but ought to be." Tobi Karchmer, MD, Senior Vice President of Global Medical Affairs at medical technology company BD, pointed to "huge gaps in medical education around leadership that persist despite how increasingly important leadership training has become for physicians. The medical education system has really changed very little in the last hundred years." Deloitte's Radin estimated there are 700,000 physicians in the U.S. and seven percent of them are in leadership positions. "We need to dramatically increase that," she said. "This program serves that goal," Radin continued, "because historically, medical schools have never included curriculum elements like people development, strategic thinking, leading through influence, or the aspirational vision required to galvanize an organization. The DNA of med school grads has been wired in a very specific way that produces excellent medicine but not people who can manage an enterprise or set a strategy." As part of the three years of research and organizing that went into the creation of Wharton Executive Education's Physician Leadership Academy, Deloitte surveyed physicians in leadership positions across the country. One of the most important findings was that those executives understood their own institution's area of activity but lacked a broad perspective of the overall dynamics of the rapidly changing health care industry. PLA participant Allison Suttle, MD, agreed. She's Chief Medical Officer at Sanford Health that operates 43 hospitals and is the largest employer of physicians in North and South Dakota. "When you're in the day-to-day with meeting after meeting it's really hard to get a 30,000-foot view of things," she said. "Health care is changing very dramatically and it's going to take a lot of adjustments in the leadership role to craft what the 'new health system' is going to look like." During the PLA program's four-day opening October module, each physician participant identified a major challenge that his or her office was facing in the coming year. Much of the coaching and mentoring they receive is aimed at more effectively addressing those real-world challenges back in the office. "Along with the insights physicians get from the theory and research discussed in the classes, they also get tools that help them understand how to actually change things," said David. "And with their mentors and coaches, they get hands-on, practical assistance in applying their new knowledge." Even on day two that appeared to be happening as participants were asked if they had learned anything new. "One of the very specific things I came away with today was thinking about how all of us live in line-and-box matrix organizations and how we describe and think about our complex organization's function," said the University of Michigan's Desmond. "We talked about how it might be useful to think about your organizations as networks instead of 2x2 or 3x3 flat matrices," Desmond continued. "Networking implies a different way of connecting with different values and levels of importance to certain nodes within the network. That concept suggests I should go back and try viewing my organizational functions as a network. This challenged my assumptions about how we are structured." One other point on which virtually all of the participants concurred was that the peer interactions they were experiencing were as valuable as the program's classroom sessions. "The thing that makes this program so useful is its combination of the academic and the practical in a way that is so directly relevant to us," said Daphne Haas-Kogan, MD, a Harvard physician who in 2014 was named Chair of the Department of Radiation Oncology at Dana-Farber/Brigham and Women’s Cancer Center. "The peer group here is superb," Haas-Kogan said. "I think we're learning as much across the table from each other at lunch and dinner as we are from the lectures. We're all in the same boat sharing similar challenges and I'm picking up some very interesting take-home ideas from others who have had to deal with the same issues."